Cropping is an essential image editing function, helping to improve composition of a photo, to emphasize the focus of an image, or to reduce unnecessary parts of a picture. While many Mac users use third party tools to perform image cropping, no additional apps are needed to perform the task in OS X, because the bundled and under-appreciated Preview tool has crop functionality built right in to its editing toolset. To try this yourself, you’ll want to have an image handy that you can crop down, and just about any version of Mac OS X. The rest of the process is very simple and can be done quite fast, particularly once you learn how to use the tools and master some keyboard shortcuts. See, that was easy right? You now have a cropped image. You can draw the rectangular selector to whatever size you want and the crop function will take care of the rest. Remember that by doing this you’re also indirectly resizing an image by reducing the total amount of pixels contained in the image file, but unlike the bulk resize functions you can not crop in a similar bulk fashion with groups of images in Preview because it requires a unique selection. Memorizing the simple keyboard shortcuts used in this task can make the cropping process extremely fast, and combined with the general speed and efficiency of Preview app it’s usually much faster to go this route than opening images in Photoshop or Pixelmator. 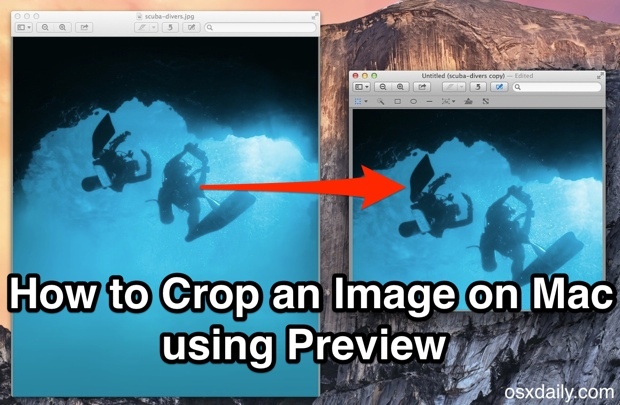 The Preview app of OS X includes a myriad of image editing functions, markup tools, and conversion functions that are largely overlooked and underused, so if you’re just learning to use the Preview app for simple photo modifications and editing, crop is a great place to start. Of course this is limited to the Mac, but for users on the mobile side of things there is no Preview application to be found on the iPhone or iPad, so instead users can find the Photos app supports cropping photos in iOS very easily with a similar selector tool, or use third party tools as well. if you’re cropping to save size, don’t forget that an unadulterated modern version os osx will keep the old copy as a version. To restrict it to square hold command-shift to start from corner, hold command-option to start from center. To get pre-programmed proportions you have to use iPhoto. Do not save the new cropping if you need to keep an original. Unlike an earlier preview you should command-s before cropping to keep an original version. I slide the photo size to max size when saving the command-s version. The new preview version has a quirky way of viewing a full screen slide show. You select multiple files, open them, hit command-f for slide show, then WAIT for all the visible files to show up in the thumbnails along the left column. If you don’t wait the program may open a picture halfway into the show, not the first image. THEN you have to immediately stop the slide show autoplay if you don’t want the slide show to play. All very counterintuitive and bothersome compared to the earlier versions. Great added tips, the Shift+Drag and Option+Command+Drag additions are particularly great tricks, thanks! Why not just double click to open? Preview has been my quick and dirty image editor for years. And for PDFs. My understanding is that there will be a Preview app in the upcoming iOS 8. ‘that would be awesome! It used to be easier in OS preview until after OS 10.6 Apple decided to hide the “Crop” away from the Menu Bar. GIF animation has not been supported since OS10.5 It gets worse every generation of Preview. I have a new Mac Air and “my” Preview doesn’t have that toolbar. It shouldn’t be so difficult to simply edit a photo. I have to go through another app to crop a pic as everything I’ve read and tried does not work for me. How do I edit or crop out stuff from an image? If your toolbox is greyed out it’s because the picture file is locked and you can’t edit the file. Copy the image and create a new file with the image to edit it. I have the same issue with a group of pictures I am trying to edit – photos which I personally took – and the image shows as unlocked. If the images are unlocked, why is the edit icon greyed? I don’t see “crop” anywhere in the latest version. There’s a comment above that says it’s been “hidden” – is it still available? And I completely agree – it shouldn’t be this hard just to crop an image. Yes the Crop option is in all versions of Preview for Mac. Instructions don’t work at all. There is no “Save As” option and the Save option just saves the original image. the next one will be a PC…. Patrick Hecking – The crop feature is available in the very latest version of preview, you just need to click the toolbox icon next to the search bar instead of the pencil in the photos. Worked perfectly for me to crop a jpg. 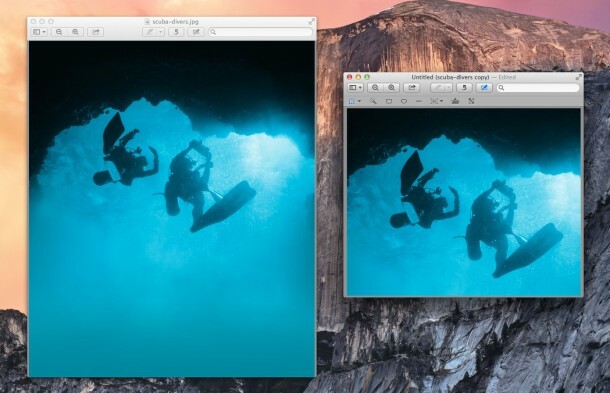 On my iMac running OS X Yosemite, you drag to crop, then click Tools, Crop, to crop it. 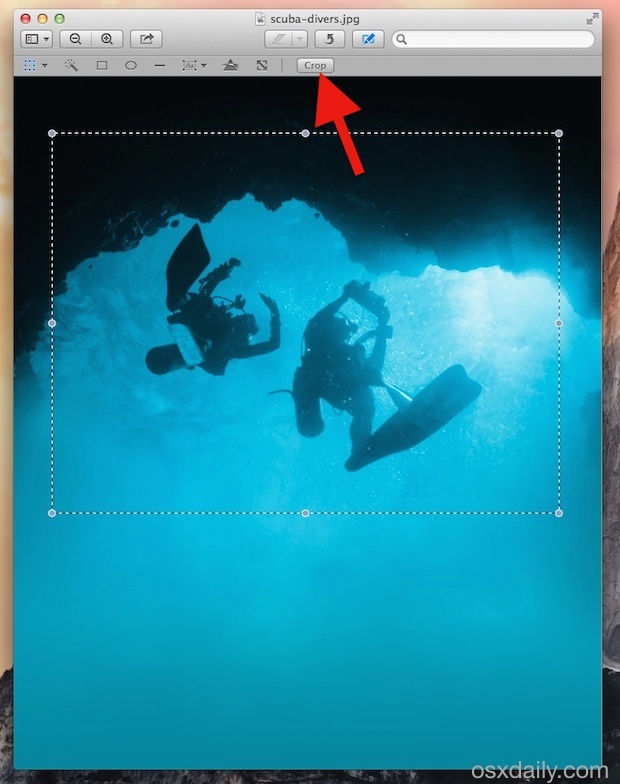 Is there a way to define the final cropped image size by entering the size of the intended cropped image without having to drag the handles on the dotted lines? I don’t have a mouse and dragging the handles on the dotted lines using the track pad on MacBook Pro to get a precise image size is finicky at best if not impossible. What’s wrong the Apple people? Are they intentionally trying to drive customers away from purchasing their products? Or is this designed in contrived and unworkable functions intentionally built-in to force clients to give-up and purchase extravagantly over-priced professional editing software that ONLY professionals need? Any help would be greatly appreciated if there is such a workaround… though I highly doubt it! This philosophy of built-in obsolescence so notorious of Apple is continuously driving customers away and they’re not “smart” enough to realize this inevitability. I purchased my MacBook Pro in 2011 and vowed soon after that this is the last Apple product I’ll ever purchase. I feel sorry for the saps who regard Apple as some type of divine manifestation and will defend its’ products from a place of ignorant bias in oppose to using reasonable assessment of the functionality of the products. In High Sierra, Apple has cunningly hidden the cropping toolbar. Once you have opened the photograph in ‘Preview’, you need to click on the right most icon, which looks like the top of a baby’s bottle inside a circle. It will then show you the ‘mark up toolbar’. And that’s another half hour of my life I will never get back.